Sure Signs That Jupiter Is In Leo…! ….Your “Intro to Ballroom” dance class is full to capacity and then some! The enthusiasm and encouragement of your ballroom Guru is positively contagious, creating a warm and festive atmosphere that fills up the room to the point of overflowing. Your heart rate is elevated; the dew in your mane collecting at the nape of your neck and causing stray wisps of hair to spring into buoyant curls. The upbeat tempo of swing and joy of just having fun has you bubbling over with exuberance and laughter. From the Robin Wood Tarot. Doesn’t our King just look like he’s extending an arm to his lady and asking her to tango? Grab that hand – it’s time to dance! 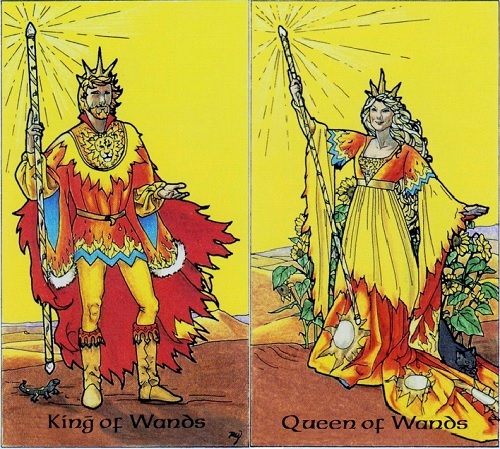 Everybody has a King/Queen of Wands somewhere within them – these archetypal monarchs have joie-de-vivre in spades and absolutely lust for life! Venus has just entered Leo and will eventually augment Jupiter, so don’t be a wallflower because this is a time to put yourself on display! Leo is a consummate performer and entertainer, so why not give ‘em a show? We have expanded access to these fiery archetypes within our personas now and can easily connect to our vivacity, creativity, confidence, and belief in ourselves as talented individuals, so show the world how YOU shine! All the world is your stage – embrace the close-up! 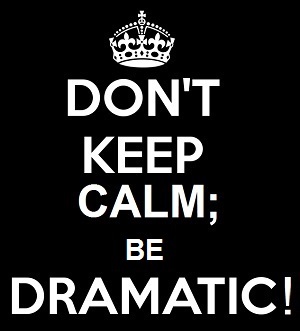 Everybody’s got drama at times – me, you, him, her, them. It’s something that – at one point or another – is universal to the human experience, so this isn’t about judgment because we all experience the natural ebb-and-flow of the Comedy & Tragedy known as “life”. But there is a distinct difference between this being “situational” vs. “habitual” in nature, and as the Leo Moon joins with Jupiter in Leo, I want to talk specifically about the latter variety of drama. Jupiter is a planet that excels at providing us with perspective when resonating in Hi-Fi – when something is too “first-person” for us to see, it allows us to back up and get a bigger-picture view on things as if we were looking it from high above. Now the Moon is a creature of habit; it shows where we do things instinctively on auto-pilot because we are in our “comfort zones”, for good or ill. The Leo Moon can be habituated to drama when expressed in Lo-Fi, where it derives some measure of satisfaction off there being some sort of “scene” for it to star in. When resonating with this end of the vibrational spectrum, the Moon in Leo may indeed be fed off a “big production” in one respect or another in some (or multiple) area(s) of life, and it’s precisely this craving that can lead Lo-Fi Leo to create more of the same. Allow me to explain and provide some perspective…. Leo/Solar energy is primarily one of display, where we’re apt to “put on a show” or “make a spectacle” for better or worse – putting it more succinctly, this often translates to “drama” in one form or another. Now sometimes this characteristic is used for entertainment value or comedic effect where this “performing” energy can be channeled beneficially, because here we are sharing our “light” with others – reference famous Leo entertainers Lucille Ball, Steve Martin, Tom Green, Steve Carell, and Denis Leary just to name a few examples. Indeed, one facet of Jupiter in Leo’s energy entails looking at positive avenues of self-expression, because Jupiter has been classically referred to as The Great Benefic and Leo is the sign of creative self-expression. This can entail comedy, dance, and of course, the Performing (or Visual) Arts. But, as we know, each planetary vibration also has the capacity to be done in Lo-Fi. Jupiter’s Lo-Fi manifestation can signify excess, where there’s “too much” of a given thing. In the sign of Leo, this can be drama as well as self-centeredness, as the dark side of Leo/Solar energy can be that it expects the world to revolve entirely around it. Thus this energetic combination does have the capacity to create what I’ll (half-humorously) refer to as “Drama-Llamas” – you know, the types of people who habitually seem to have an over-abundance of it in their life (usually the self-created kind) and so it becomes all about *them* and *their show*? It’s no longer about sharing one’s light and giving of oneself; it concerns having an audience, and it seems as though their whole raison d’etre may be to get the world to stop and revolve around them. I generally correlate this sort of behavior to there being a lack of positive attention in childhood, because Leo is the sign of children and Jupiter can have an overcompensatory vibe. In such instances, the individual may subscribe to the (conscious or unconscious) belief that any attention is good attention if it gets people to notice them, and – more specifically – if it gets people to notice their needs if the Moon is involved (say in Leo, the 5th House, or wired to the Sun). Now I don’t know about you, but when I encounter this sort of thing, I’m personally inclined to change the channel. This kind of schtick is only entertaining in comedy clubs, soap operas, or on late-night TV – I really don’t want it in a close personal relationship of any kind, because how could there possibly be space for reciprocity – that all-important relationship maker or breaker – if someone’s too busy making it all about their own made-for-primetime telenovela? There is no room for co-stars, no; this Demanding Diva energy says there is only ONE. But with Saturn in Scorpio currently engaged in a loose but ongoing square to Jupiter in Leo, looking at the angle of how an excess of drama (Jupiter in Leo) can be a real time & energy sink (Saturn in Scorpio) is a wise thing to do. Drama-Llamas often fail to see just how self-centered (again, we’re talking about Lo-Fi Leo here) and taxing (Saturn in Scorp) this behavior can be, because this would require them to step outside of the first-person, which they’re not usually accustomed to doing by default. But Jupiter reminds us to put the repercussions of this kind of behavior into perspective as well, as Saturn is an energy that signifies consequences. 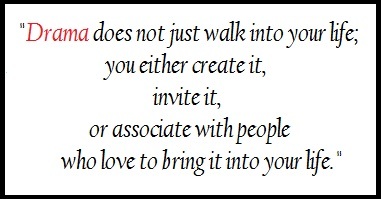 Because when one habitually creates drama, this vicariously spills out onto close associations (Significant Other, family, friends, etc. ). 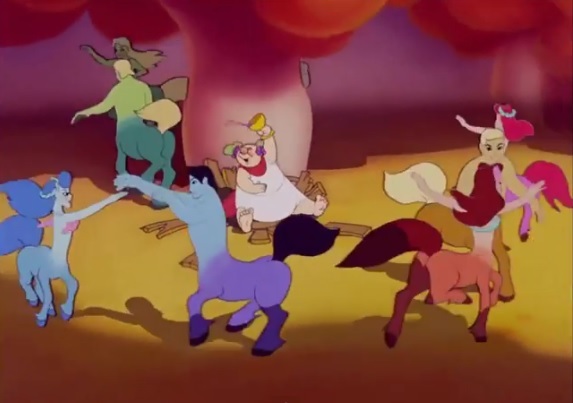 Bystanders are then forced to watch “The Drama-Llama Show”, as such behavior leaves said Llama unavailable to be present for others’ trials, successes, tribulations, etc. since they’re too wrapped up in starring in their own production. That is, of course, unless we change the channel or turn it off…. 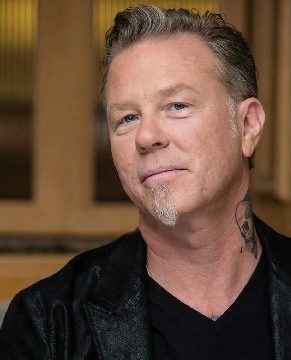 “We were swollen in the head… and shrunken in the heart” -Metallica lead singer James Hetfield, Leo Sun w/ a Capricorn Moon, on a period when his band was, in his own words, “believing in [their] own hype”. This is where rock star Leo energy has the capacity to go wrong, when (as the late, great Isabel Hickey would say) Leos “enthrone the ego” where the heart should be. Leo may be the regal king of the zodiac resplendent in all his warm, benevolent glory, but on the other hand he can also be the tyrannical despot when he becomes the center of his own universe and attempts to arrogantly force the world to revolve around his own ginormous ego. 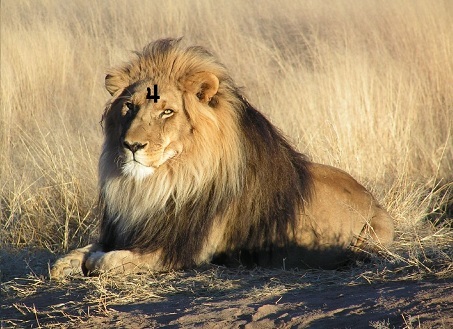 This is one of the potential hazards with Jupiter – The Great Expander – now residing in Leo, the Sultan of Swagger. The head must not be allowed to grow larger than the heart, and (false) pride coupled with a lack of genuine confidence is what generally causes this to happen. Fortunately for James, his Capricorn Moon is there to keep it real and keep it grounded – experience has taught him firsthand the importance of humility, so with any luck at all he’ll be able to maintain this level of wise self-awareness even as Jupiter creeps up to his Sun to launch him further into the stratosphere. Others – including those with a predominance of the Fire element in their chart – might want to keep an eye on this tendency during the next year, because when misapplied Jupiter in Leo does lend itself to braggadocio. Globe-trekking, beneficent Jupiter has entered fiery Leo, where it will remain for an entire year! So what can we expect out of this year-long transit? Well, for one it’s a very beneficial energy for creative types – this can be art, sculpture, writing…any medium used for self-expression at all, really – because it expands creative mojo. Fire signs (Aries, Leo, Sagittarius) in particular are really going to be juiced by this energy, but Sadge and Leo Suns will feel it in spades. Jupiter is also known as The Promotor – he blows us up and makes us larger-than-life so that our reach is expanded and we’re more visible to a wider (hopefully global) audience. As such, this astro-influence is bound to be a boon for artists & other creative types looking to get their creations “out there” and seen because this is such a conspicuous, high-profile energy. I awoke from a dream this morning, hazily recalling that my sleeping hours had been spent in a house filled with loads and LOADS of lions! Amusingly, the Sun enters Leo today…and when it does it will be greeted by the Lord of Abundance, Jupiter, who just entered Leo for a year-long stay. A plethora of lions indeed….! Needless to say, the Leo vibe is getting super juiced up, and it only grows stronger as we approach the weekend. 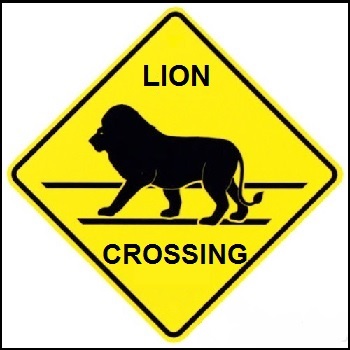 A Leo-infused New Moon takes place on Saturday right next to Jupiter – be on the lookout for lions crossing….